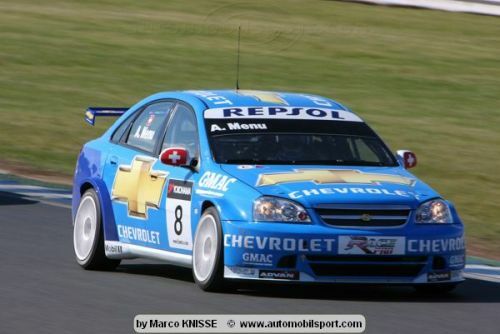 The stage was set for a dramatic race with Robert Huff in the Chevrolet on pole, and Gabriele Tarquini, a title contender next to him in the SEAT Sport Tdi. From the rolling start Tarquini took the lead over the line, but then things began to unfold. 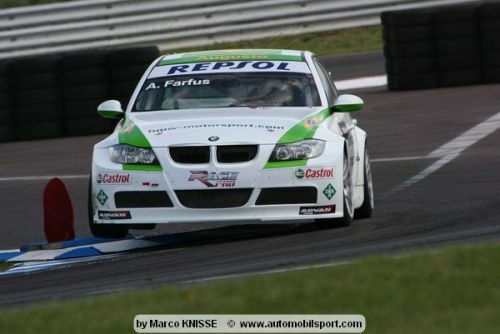 Augusto Farfus took his BMW Team Germany car up the outside of the pack and stayed out of trouble. He took the lead out of the first corner and stayed there for the rest of the race, only strengthening his lead away from the field. Tarquini and Huff followed him round the corner, but Nicola Larini, who was squeezed by Jordi Gené and Rickard Rydell, spun and hit his team mate as he went out at turn 2. That ended Larini's race, but Huff recovered and chased after Tarquini. 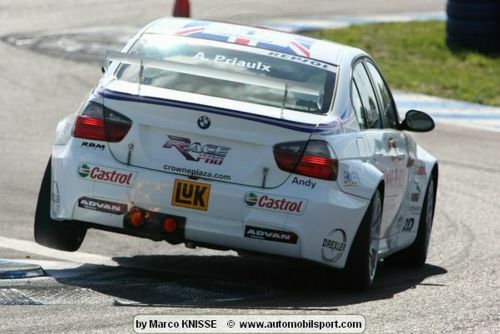 Further back Alessandro Zanardi was pushed into a spin and Andy Priaulx took to the grass. After everything had calmed down, Farfus was left out in front with the others fighting for second place. Tarquini was beginning to struggle and first Huff pulled off a move up the inside, followed quickly by Alain Menu to take the last podium position. Even though Tarquini fought to save the position he was unable to and began to fall back down the field. Tiago Monteiro took fourth position, followed by team mates Gené and Rydell into fifth and sixth places respectively. Tarquini then clashed with Andy Priaulx as the British driver attempted to overtake him for seventh. The collision ended with Priaulx going backwards into the tyre wall and out of the race. Tarquini ended up falling back to twenty-third position overall. Other drivers who experienced troubles were Jörg Müller and Yvan Muller who both had technical problems, which caused them to fall back down the field. Tom Coronel finished in seventh position following his relegation to ninth after qualifying. This means that he will start on the front row in the second race alongside Félix Porteiro who won the pole on the reverse grid. Pierre-Yves Corthals had looked on course for the win of the Independents' race, but he had an incident near the end of the race and left the win to Stefano D'Aste. Other incidents on the track were between the N-technology Honda car of James Thompson and Wiechers-Sport's Olivier Tielemans who tangled, with the British driver going off onto the grass. As he was recovering he almost hit Duncan Huisman, Tielemans' team mate, who was also forced to take to the grass. Both the Tarquini-Priaulx and Tielemans-Thompson collisions are currently investigated by the Stewards. Alessandro Zanardi: I earned my holidays! Alex Zanardi - Moderately psyched up after the final twist!